We’re leaving tomorrow for a short 3-5 days vacation on Ã–land. We’re going to the same place as last year but with different company: my mom and her fiancÃ© PO. We had so much fun last time we were on vacation together so I’m really looking forward to this. Anyway, I’m probably going to unplug everything in the flat while we’re gone, so the server will most definitely be down. When I get back, I’ll be sure to post vacation photos in the photo gallery! This entry was posted in personal on 2006-07-27 by David Tenser. I took some photos yesterday while having lunch at a restaurant in Kvicksund. After that, we went to one of Sofie’s older sisters to see her horses. I’m slowly starting to master the new camera I bought last month (Canon PowerShot S3 IS). This entry was posted in photography on 2006-07-23 by David Tenser. Naming issues aside, I haven’t yet found any improvements(1) in Web Browser (let’s call it that) compared to Firefox, but a few things made worse. For example, many shortcuts I use daily are changed. I can no longer middle-click on a tab to close it. I can no longer Ctrl+Tab to cycle through the opened tabs (that instead cycles between the virtual desktops). Maybe this is configurable somewhere, but it’s definitely a degraded initial experience compared to what I’m used to. There are some true bugs as well, such as a flickering mouse cursor, non-working link clicks, slow and lagging keyboard repeating, and a few misaligned pixels in the Gecko rendered output, but that’s probably expected in a beta (although I’ve never experienced problems like this in Ubuntu, beta or not). Maybe it’s KDE issues too. Coming from Gnome, I honestly don’t know. I’m going to blog more about Freespire in general in the future, I just wanted to sort this out about LBrowser Web Browser. (1): Ok, I have found one new feature, but I’m not sure if it’s an improvement. When you hover the mouse over a word, it becomes highlighted in yellow. If you click on it, a tiny (almost illegible) pop-up menu appears with a few somewhat confusing items, such as “Web”, and “News”. Appearantly, if you click on e.g. 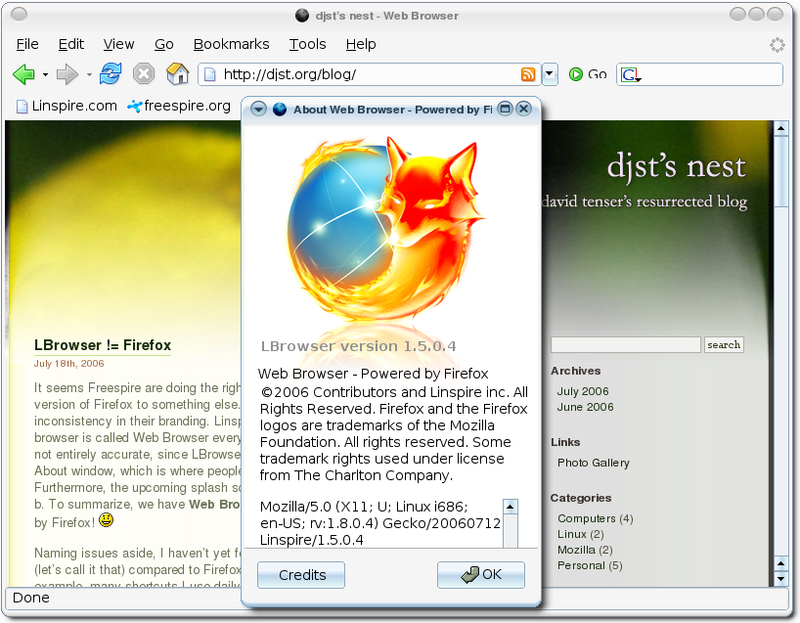 “Web”, a web search is performed on the highlighted word. It would have been much clearer what the menu item does if it had been labeled e.g. “Web search for [word]”, but the general idea is neat. I think it would fit much better in the normal context sensitive menu though. This yellow menu lookalike hack isn’t exactly accessible. This entry was posted in Linux, mozilla on 2006-07-18 by David Tenser. I’ve updated the planet.mozilla.org subscription now so it doesn’t post my non-Mozilla-related posts there. This is just a test to verify that it works. This entry was posted in blogging on 2006-07-05 by David Tenser.